Series title: Do animals daydream? This series of paintings is concerned with the application of human characteristics, such as humor, jealousy, greed, power, assimilation, friendship, etc. as applied to animals and fish. What do animals think about? Are they concerned with their future, entertainment, materialism, freedom, jealousy, sympathy, or anxiety? Do pigs have a sense of humor? Do chickens have aspirations to fly? Do hunting dogs suffer the pain of guilt? I am adjusting the expected, perceived character and personality of each subject. This is basic story telling, encouraging the viewer to recall similar experiences and feelings. 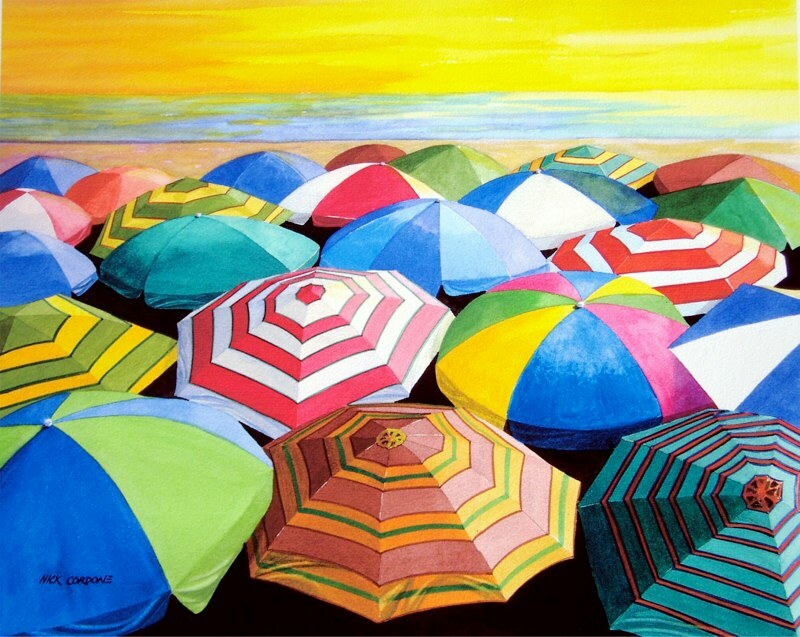 This series of paintings is made up of various color compositions using beach umbrellas, beach balls etc. incorporated into landscapes. These are colorful, playful images each expressing it's own feeling for the day. Creative sky formations are combined with brightly colored umbrellas to remind us of fun days at the beach. This Outer Space series of paintings is concerned with the future colonization of mankind beyond Earth. Humans will, most likely, continue to do the same things (mistakes and triumphs) as we have done here on Earth. Hitch a ride, go for a joy ride, create wars, make love, etc. The wooden objects were first created by hand, set into position, lighted and used as reference for each painting. You will find various constellations in the backgrounds of these composition.